This stilt duplex TWO (2) bedrooms and TWO (2) baths also 2 queen sofa beds in living room. (Maximum odcupancy is SIX (6), 1,230 living square footage. Plenty of car and boat trailer parking either under carport or on gravel next to unit. Porch has partial glass block wall for privacy (separating next door unit #1098068, also owned by us and option to rent both units together). Porch is great for enjoying breakfast, lunch and dinner overlooking canal and viewing evening sunsets. Wi-Fi access, fully furnished, amenities featured are listed below including: 46" flat screen TV in living room, and 32" flat screen in master BR. Central Air and ceiling fans in all rooms, kitchen fully furnished with all you will need during your stay. 37.5’ of boat dockage on a 100' wide deep water canal with cement bulkhead (lights, electric, and water at dock.) + outside shower and bait freezer. 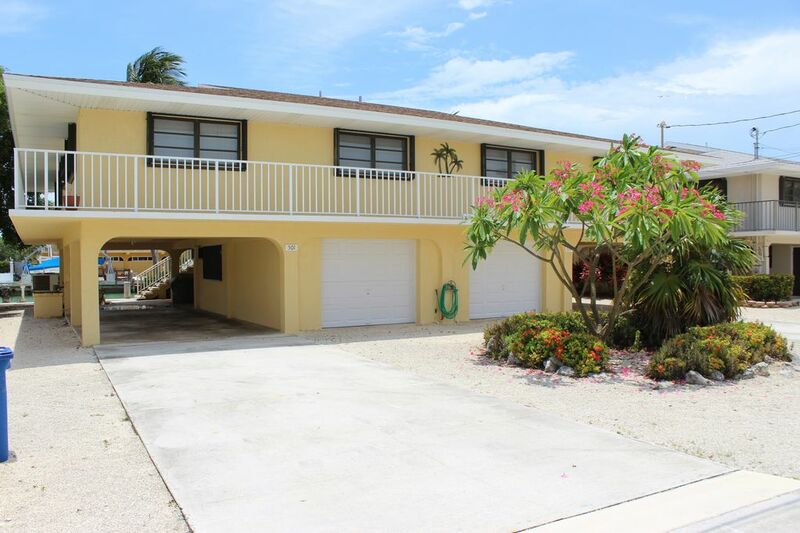 Very easy access that leads to both the Atlantic Ocean and the Gulf of Mexico. Take an evening stroll to Key Colony Beach "Sunset Park", where you can view the beautiful keys sunsets, and make sure you bring along your evening libations & your camera. Also on KCB is a 9 hole PAR 3 golf, tennis, bocce ball, basketball court, pickle ball, horseshoe area, playgrounds, bike, walking and roller blade paths, boat rentals, snorkel & dive boats, and deep-sea fishing charter boats. RESTAURANTS ON KEY COLONY BEACH: Key Colony Inn, and Havana Jacks (all a short walk or drive). Sparky's Landing and The Island nearby. Many more restaurants in Marathon too numerous to mention (List posted in rental units). Many nearby attractions and activities . . Dolphin Research Center, Crane Point Hammock & Museum, Theatre of the Sea, Bahia Honda State Park, Key West, etc, etc. Have owned and been renting this duplex since 1989. Our family and friends spent many vacations at Sunkeys, thoroughly enjoying many days there. Husband and I are now full time residents in Key Colony Beach. 1/2 mile to ocean beach and Cabana Club pool club. all linens provided 2 changes for all beds, pillows, blankets and/or quilts. off-street parking under carport or in driveway for vehicle and most boat trailers. all bath and kitchen towels provided. NO BEACH TOWELS unless previous renter leaves some. Has 2 sofa's (each with queen pull out bed), 1 love seat and 2 chairs. all dishes and utensils included. Service for 6 and at least 2 meals without washing. Table Seats 4 plus counter seats 4. Kayak's can be rented locally - they deliver & pick up - Ask owner for information if interested. Boat Rentals are available locally. Ask owner for information if interested. Patio with table & chairs under shade of house while grilling dinner or just relaxing with drinks. Hot Tub is located at Cabana Club, a short walk or drive from rental unit (1/2 mile). Canal Frontage for Boat Dockage at Door, Fish Cleaning Table, Bait Freezer, and Outside Shower. Use of Cabana Club includes: ocean beach, pool, showers, poolside cocktail lounge, game room, fishing pier, snack bar, and Havana Jacks Restaurant. Nearby Par-3 golf, tennis, bocci, pickle ball, basketball, walking, biking (nearby bike rental). 3 Restaurants on Key Colony Beach + many others in Marathon (listings are posted in units). Thank you so much & hope next time I can get to meet you. The location is very convenient and picturesque. The accommodations are comfortable and clean. We will return when we can! We really enjoyed our stay 501 9th Street. The house was spacious, and the layout was perfect. We loved our canal view. Key Colony Beach is a wonderful, easily walkable town. Residents gather at Sunset Beach every evening to watch the sun go down. Gay was very helpful and provided extensive information about the area, including the restaurants. We loved our Florida Keys experience. Location very nice, safe neigbourhood and a nice house. Definately a place to recommend!! My husband and I thank you very much for renting from us and hope to meet you again. We hope you enjoyed the Keys and our rental. Happy New Year to you and family. Thank you John M., hope to be able to meet you on your next visit. The property is need of repair and regular upkeeping. We were very disappointed when we first walked into the property. First thing we noticed was that the kitchen cabinet drawers wouldn’t open properly and when it did it was a not so nice surprise to see the inside of the drawers. The kitchen cabinet doors below the sink wouldn’t close properly and I actually caught my flip flop causing me to trip. There was plaster missing on the hallway ceiling as well as multiple water stains. The master bathroom has mold around the shower enclosure and a poorly repaired wall above the sink. Tiles are needing grout and just looks like a 5 year old did the repair. The TV in the master bedroom doesn’t work either and there was a light switch that says dresser lamp switch. No lamp on the dresser and no lights on the ceiling either. Do I continue? Pots and pans were unusable as the non stick coating was peeling off. Health hazard. The downstairs car port lights didn’t work and the dock lights worked on the 5th night of our rental. Very very disappointing. I contacted the owners and I am still waiting for a reply from them. The refrigerator looked beat up, rusty and old with all kinds of notes and instructions that were all handwritten. Lots of rules and threats of additional charges if we lowered the AC thermostat. Look elsewhere. The view is great. The neighbors are nice. Ocean and bay access was short and quick. Other than that, the place leaves much to be desired. Our family rented both units as the property is a duplex. $4000. for a weeks rental and couldn’t get the owners to address or even reply to my concerns. Let’s not get into the glassware and utensils that they provide. Won’t be renting from them ever again and will suggest you keep looking. Lino F. I get from your response that you are a very picking person. We have addressed some of the items. Hope you find a rental next time more to your liking. Lobster Wks (July/August) and Christmas/New Year Wks Addt'l $300 $500 credit card deposit at time of booking (is deducted from Total) $120 cleaning/processing/fee per rental + 12.5% Occupancy Tax. $ 61 Security Damage Insurance (covers up to $3,000 unintentional damage) Weekly additional guest fee for over 4 people is $25/wkly per guest at all times of year (maximum occupancy per unit is 6). DISCOUNTS MAY BE GIVEN (speak to owner about this).